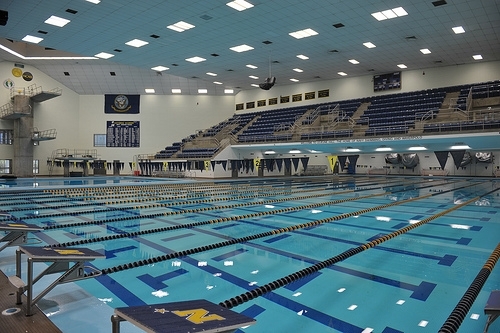 Something crashed a swim meet at the Naval Academy’s pool. More than 800 swimmers, ages 8 to 17, gathered there over the weekend for the Maryland Swimming Championship meet, held at Lejeune Hall on the academy’s campus when an intestinal bug struck, reports The Annapolis Capital. The pool soon became a sick ward, with enough swimmers vomiting that the meet had to be stopped for 15 minutes so the deck could be swabbed. One parent at the meet told The Annapolis Capital that she saw a swimmer hit the end of his lane, throw up, then flip and continue the race. “It was crazy,” the parent, Carole Parker, told the Capital. Dr. Lucy Wilson of the Maryland Department of Health and Mental Hygiene is trying to determine what sort of gastrointestinal pathogen it was, which produced nausea, fevers, and diarrhea in more than 100 participants. She said the most likely culprit for spreading the disease was the crowded poolside area, not the water. “Our expectation is that it won’t be the pool itself, but would be passed person-to-person,” she said. Her center is now collecting stool samples. The apparent cause of the illness was not the Naval Academy pool or facilities, subsequently tested by Anne Arundel County Health Department and academy staff, academy spokewoman Deborah Goode said.